For those who only want the best luxury sedan, with a spirited drive, there is nowhere else to look. Did we mention the price? For anyone who follows tech innovations, the 2012 Mercedes-Benz CLS 63 AMG is like the iPhone 4S of automobiles. There’s a sleek exterior, but on the inside, the tech advancements take well-known concepts – like adaptive cruise control and blind spot detectors – and push them even further. For alpha techies, driving the CLS 63 is just a notch more fun than cruising around in the Lexus CT 200h, another car that has a bevy of tech advancements. The fact that the CLS 63 is the AMG version means you are getting the raw horsepower of an SLS combined with the sleek styling of a C-Class luxury car. The CLS 63 is striking at first glance. There’s a slight bubble curve to the vehicle from front to aft, as though Mercedes decided to squish down the normal C-Class look for a bit more aerodynamics. 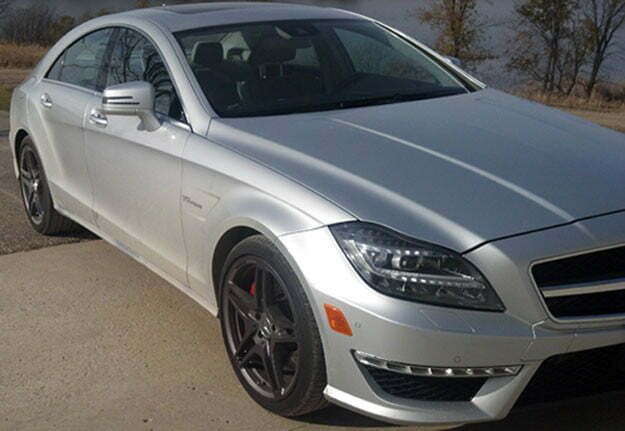 Our CLS 63, a sleek gray silver with chrome accents, came equipped with racing rims and tires. 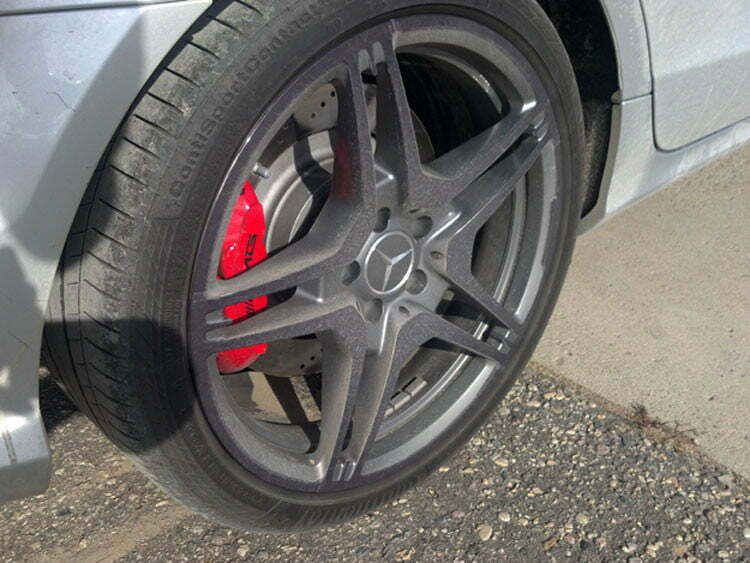 The rims, which reveal the same exposed brake pads as the SLS, got most of the attention from gathering crowds. That’s right, this is the second Mercedes-Benz test where crowds gathered around the car in droves. People just seemed to be drawn to the racing stance. A few commented on the front hood emblem that looks like a medallion, and the unusually low profile. Inside, the C63 provides seating for four. There’s a pleasant cocooning feel that is not as tight as an Infinity M56x or as spacious as a BMW 7. Our C63 had no rear television system, which is something even a Hyundai Equus has these days. The trunk is spacious, not cavernous. Rear headroom, at 36.1 inches, is plenty for most passengers. On the open road, the CLS 63 AMG has no equal in the luxury sedan category. There are so many refinements to the driving mechanics that it takes a week to discover them all. One is that the adaptive cruise control, which adjusts the speed of the car based on the vehicles in front of you, is more refined. Some cars, like the 2012 Acura RL, do not ease you into a slower speed but can sense other cars rather suddenly. Not so with the CLS 63, which slows down so gradually that you barely notice the change. On corners, the vehicle also slowed just a bit, more due to the shift in the suspension than any false positives about other cars. You can nudge the Distronic Plus lever to increase speed one MPH or, with a heftier tug, raise or lower in 5MPH increments. When you make a turn at night, the CLS 63 emits an extra light to the side of the car so you can see the road easier. When the blind spot indicator flashes in a side mirror, but you decide to push the turn signal anyway, the CLS 63 emits a warning chime. Over time, if you drive too long, vary your speed too much, or waver on the road, a warning chime sounds and you see an “attention” icon that looks like a coffee cup. The car is suggesting that you take a break for a while. The CLS 63 goes a few steps further than this even. Many cars, like the Cadillac Escalade, have auto high beams that dim when another car approaches. On the CLS 63, the lights dim, but they do so gradually, as though you are using a dimmer switch. The lights wait longer for the car to pass and then resume. Another finding: if you jog down too fast on the adaptive cruise, the brake lights turn on – something we have not noticed in other luxury cars that sometimes only let you lower the speed gradually. There’s even a “hold” mode where you can set the car in park on a hill, then press gas to go. With all of these safety features, you might wonder where the “AMG” moniker comes into play. Like the SLS we tested recently, the CLS 63 is amazingly fast. We clocked a 0-to-60 time of about 4.5 seconds. Also like the SLS, there’s an RS mode where you hold down the brake, switch the dial, confirm with a paddle shifter, press the accelerator, wait for the car to rev to about 3,000 RPMs, and then “launch” for a faster start. There are two sport modes (S and S+) that tune the shifting through gears for faster starts. You can also adjust suspension for a comfortable, easy ride at all times, or a stiffer, road-hugging feel for tighter control. There’s also an all-manual mode where you always have to paddle-shift. Many of the features in the CLS 63 go one step or two beyond what you will find in a BMW 7 or an Audi A8. The adaptive suspension eases you smoothly around corners, and you barely even notice that the car is adjusting for you. There’s a pleasing rumble that emanates from the dual exhaust. It’s not as loud as the SLS or a Camaro SS, but this is a luxury sport vehicle, not a sports car. Handling is precise and comfortable, with plenty of power. We have never felt such a rush in any car test as we did when passing another car at about 75MPH. There is just a horrendous amount of power in the 518-horsepower, 5.5-liter V8 engine, which has 520 ft-lbs. of torque, especially for passing. We’d be remiss if we did not mention the sound system. We’ve never been huge fans of Harman/Kardon, especially compared to other premium-grade stereo systems. We’re believers now. The main advantage to this system is that it is amazingly distinct. On several songs by Mat Kearney, we noticed slight musical asides and synth touches that we had never noticed before. In a test of the movie Captain America, there is a whooshing theatrical quality to the surround sound. A sub in the backseat made the movie come alive, especially during the most sonically explosive scenes. The CLS 63 AMG has it all: a smooth ride, fast acceleration, an amazing stereo. No other car, including the Audi A8 (which was not nearly as fast), or the Infiniti M56x (which does not have as many safety features), or even the Mercedes-Benz E-Class (which is not as sporty) impressed us as much. All of this luxury comes at a price, of course. Base price on the CLS 63 AMG starts at $94,900. With all of the extra tech features, racing wheels and rims, and premium sound, the price quickly shoots above $100,000. For those who only want the best luxury sedan, with a spirited drive, there is nowhere else to look. At least from the luxury sedan and sports mindset, we’ve not found a better car on the road.